I will tell you about a lovely meal in the town of Kirkjubaejarklaustur. This town was our base for exploring Southern Iceland. We stayed for 2 nights at the Icelandair Hotel Klaustur. The 1st night we decided to eat in the hotel restaurant, which had a good reputation, and it was the most expensive of the trip. To start , we ordered an appetizer of goose that they gave us half the macerated and half smoked. 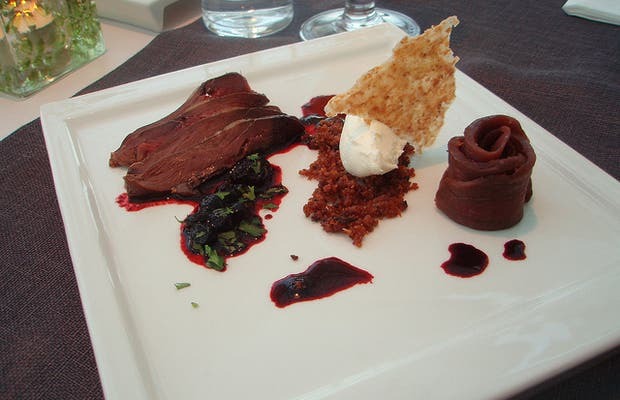 It was accompanied with a sundried tomato sauce, which is very typical of Iceland, and cranberry sauce. Next, I ordered a Arctic char was delicious and whose garrison were boiled potatoes, shallots, sautéed vegetables and a sauce of pumpkin.